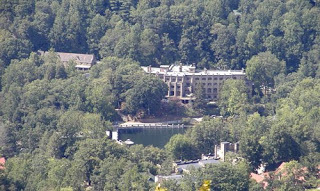 If you drive in to the town of Black Mountain, about 10 minutes west of the Inn on Mill Creek, and then head north, you’ll come upon the beautiful little town of Montreat, North Carolina, home of Billy Graham, Montreat College and about 17 great hiking trails. 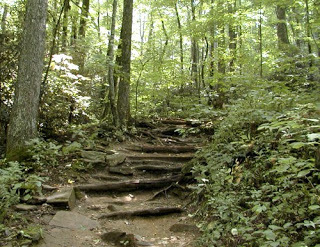 As you near the top, the woods give way to a rocky outcropping. 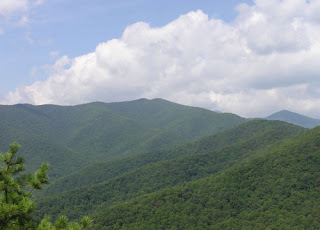 The hiking becomes more challenging, and the views are spectacular. Here is a photo of the view from the first, “false” summit of Lookout Mountain, taken by our friend, Nicole (and you can imagine what these trees are going to look like in a few weeks as the fall color season gets underway!). You can also see Black Mountain and I-40 from here, but the afternoon sun made it tricky to photograph that direction this day. 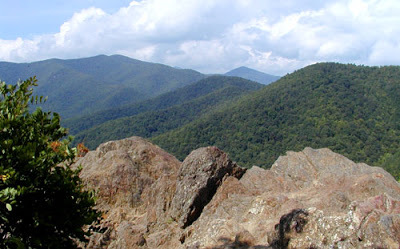 Many assume that this is the actual peak, but the true summit is further on, across a saddleback ridge and about 1/4 mile past this “rest stop with the great view”. The actual summit of Lookout Mountain, designated by a trail marker on a tree, is a bit anti-climactic, since there is not much of a view here. But there is the knowledge that you did make it to the true summit. 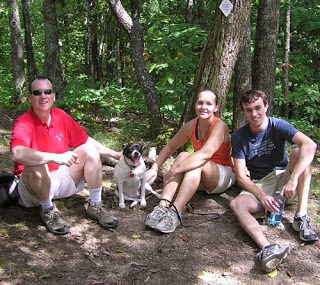 Taking a break at the summit, with Bumble the Dog (who didn’t really need or want a break yet) are Dave, April and Michael…happy birthday today to Michael, by the way! 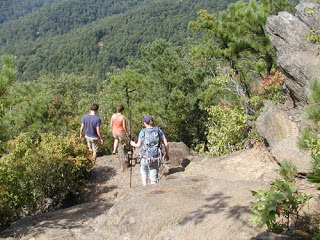 This is a great hike for all seasons, but with views like those, it makes for a spectacular fall hike. 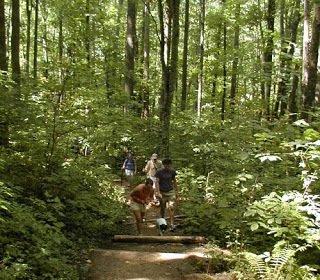 This entry was posted in Uncategorized and tagged guests, hiking, Montreat, outdoors, Summer by Inn on Mill Creek. Bookmark the permalink.